"You will be missed. You were a wonderful person and a great father. I love you ❤️." 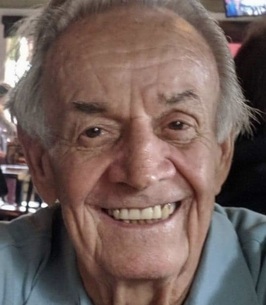 Obituary for Henry L. Berg Jr. It is with profound sadness that the family of Henry Lester Berg announces his passing after a brief illness, surrounded by his family, on Monday, November 12, 2018, at the age of 84. Henry was the devoted husband of 59 years to his beloved wife, Shirlee, the father of 5 children, 5 grandchildren, and 2 great-grandchildren. Henry was a kind, dependable, hardworking and moral man, who was fiercely loyal to his country, his family and his friends. He was born in Chicago, and served in the army before becoming employed by the Village of Skokie in Illinois, where he worked until his retirement. He and Shirlee relocated to the northwest Chicago suburbs soon after their marriage to raise their family. He loved being outdoors, golfing, taking walks, and working in the yard. He and his wife retired to The Villages in Florida in 1999, where they were able to enjoy these activities. He had a part time job working at the Paradise Recreation Center for the past 15 years and he loved the time he spent performing his work and enjoying the camaraderie of his peers. He is survived by his wife, Shirlee Ann (May), his daughters Lisa Gerise (Jeff Snyder) and Kimberly Ann (Rob Giacchetti), his son, Scott Gerard, grandchildren Alyson, Brooke, Christopher, Alexandra, Luke, great grandchildren Lorileigh and Braedon, and his beloved cat Finley. He was preceded in death by his son, Christopher Michael and his daughter, Lori Geralyn (Jim Ruzbasan). A celebration of his life and a sharing of cherished memories will be held at the Paradise Recreation Center on Friday, 16 November, from 12-2 pm. Sandwiches and snacks will be provided. He will be laid to rest at the Florida National Cemetery in Bushnell, Florida, with military honors. In lieu of flowers, donations may be made in his memory to the Salvation Army at www.SalvationArmyUSA.org. Arrangements entrusted to Beyers Funeral Home and Crematory, Lady Lake, FL. To send flowers to the family of Henry L. Berg Jr., please visit our Heartfelt Sympathies Store. I am so sorry for the loading of Henry, my condolences to his Family. I know too well the pain of losing a love one in death what helps me is God’s promise in Revelation 21:4”-And he will wipe out every tear from their eyes, and death will be no more, neither will mourning nor outcry nor pain be anymore. The former things have passed away.” Very soon death will be no more and we will see our loved ones again. I hope this comforts you as it does me. We will miss seeing your forever smiling face. Rest in Peace our dear friend. You will be missed. You were a wonderful person and a great father. I love you ❤️. Dad, you will be missed beyond words. You are forever in my heart and I’m so grateful to have had you as my father. Rest In Peace.